During my week in Mendoza, I’d come to the tough conclusion that this city of wine set among the high Andes would be my last stop in Argentina. I’d originally hoped to revisit my former home, Buenos Aires, and spend time with my porteño friends, but after hearing horror stories about how dangerous the capital had become, I decided to save both time and money and head back to Chile to get to know Santiago. I woke up early to leave for the bus terminal, where I’d bought a ticket for a 10AM departure. I figured this would allow me to cross the border before it got too busy and arrive in Santiago before dusk. As I was checking out of the hostel, the receptionist at Hostel Empedrado asked me if I had exchanged contact info with my Canadian friends, who had left earlier that morning. I hadn’t, but, curious, I asked why. As it turned out, they had accidentally forgotten their video camera under the bed and she wondered if I could return it to them. (More proof of this hostel going above and beyond!) I suggested she send them an email with my contact information, and agreed to take the camera with me to Santiago. After all, they had lost most of their possessions when they were robbed in Buenos Aires: I wanted to make sure they got reunited with their video camera! I said goodbye to my new favorite Argentine hostel and headed to the bus terminal. I had a decent amount of Argentine pesos left, and frantically purchased alfajores, chocolate, and other snacks to unload as many pesos as I could. I couldn’t find a souvenir shop near my bus platform, or else I would have walked away with some cute Argentine flag pins or something. I hung on to a few Argentine pesos in case I needed them at the border crossing. In retrospect, I should have spent all my Argentine pesos, as they are virtually worthless outside the country; I changed them for a fourth of their original value back in Peru! 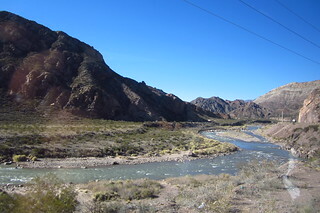 This border crossing journey was much more calm and organized than the trip between San Pedro de Atacama and Salta; this is one of the most popular routes between Argentina and Chile and it works like a well-oiled machine. So well, in fact, that I don’t remember much about the journey, except that we sat for quite a while in the line at the border and the bus got nice and toasty. 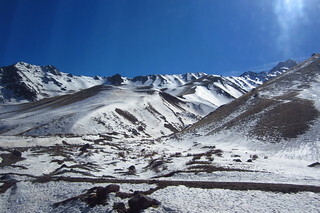 As you can see from the photos above, the route passes through the super blue rivers and lakes of the high Andes, where there are plenty of options for whitewater rafting and other adventure sports. 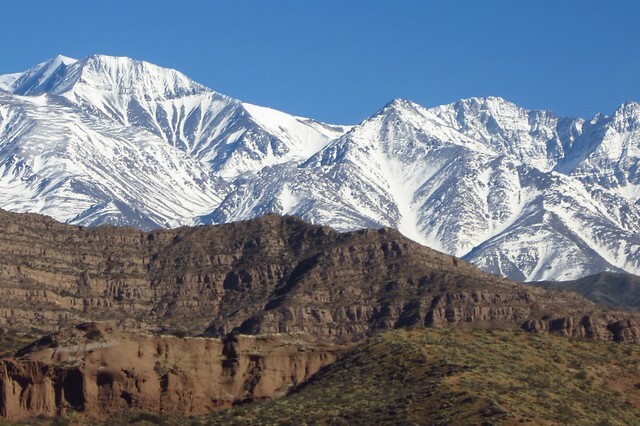 On another visit, I’d love to stay outside the city of Mendoza in one of these towns nestled in the Andes. 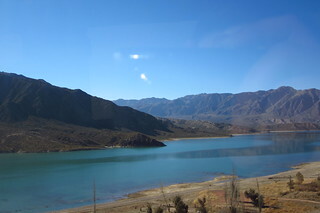 You can tell that the scenery along this route is seriously gorgeous because I got these awesome photos from inside a moving bus! Paso Internacional Los Libertadores is an easy border crossing, with both of the Argentine and Chilean immigration posts located inside the same building, making it surprisingly efficient. 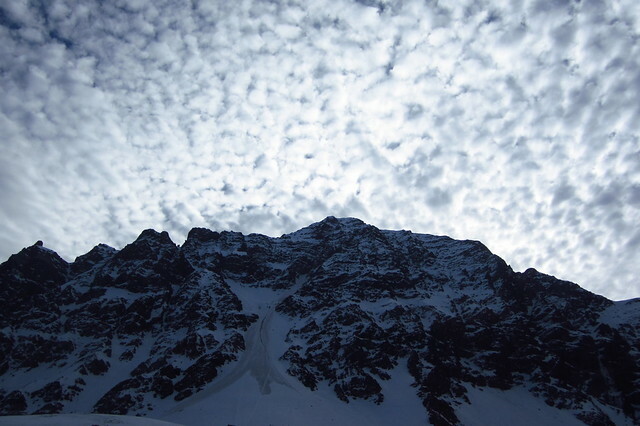 Unlike Paso Jama, they also have the equipment to clear away the snow that falls consistently at such a high altitude. Interestingly, six weeks after I crossed the border, it got hit with such a major snowstorm that it, too, closed! 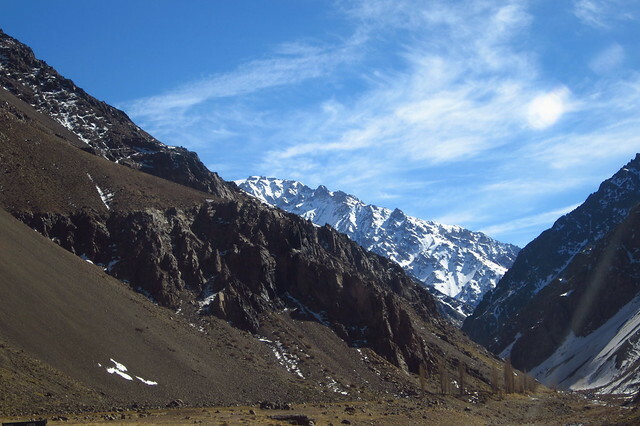 While the route to the border from Mendoza is fairly uneventful, the descent to Santiago takes you along a series of impressive switchbacks, leading to constantly changing views of the mountains. 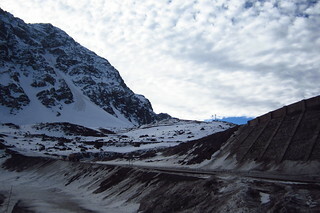 Chile’s ski resorts are nestled somewhere in the Andes near this route. 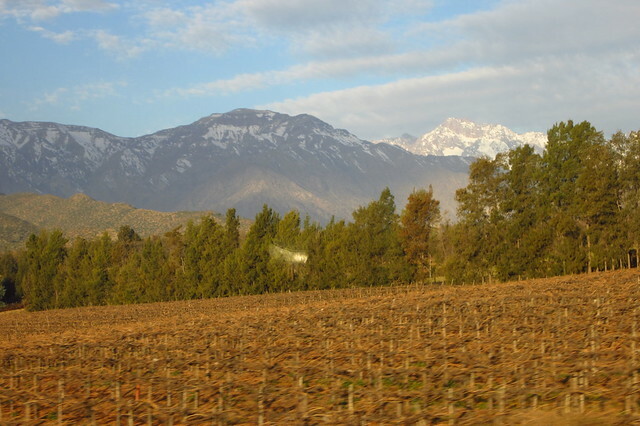 As you continue to descend towards Santiago, you enter Chile’s wine producing region, almost equally as famous as Mendoza. 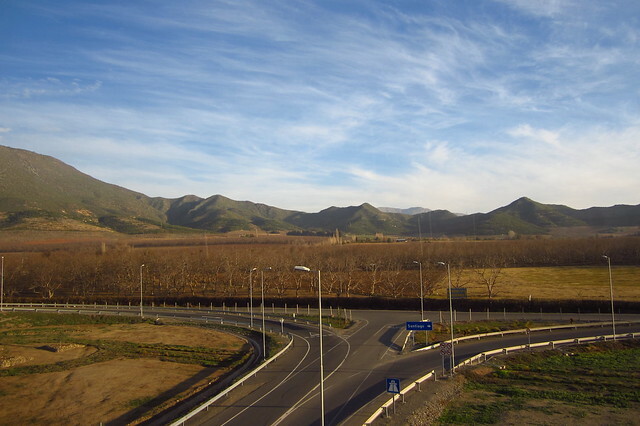 The hills changed to greens and burnished reds and browns, reminders that it was, in fact, winter in the region, even though we’d left the snow-covered high Andes. I stared out the window at the expanses of vineyards that we continued to pass. 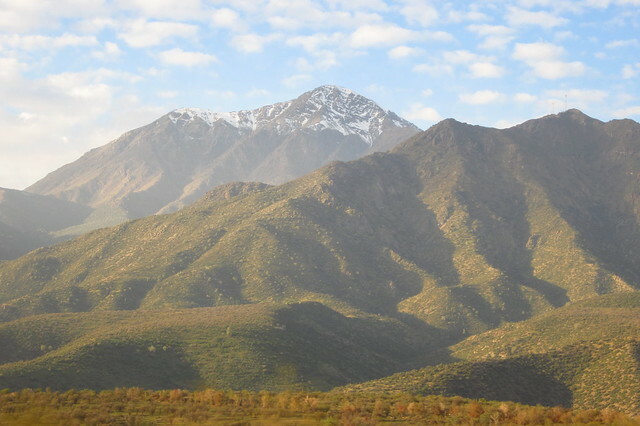 If I hadn’t just done a full tour of the wineries of Mendoza, I would have been tempted to explore the beautiful countryside (and drink more wine). 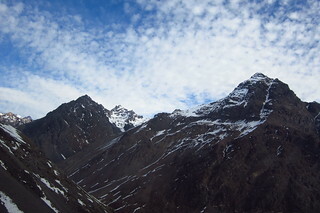 At this point, we were getting closer to Santiago and leaving the Andes. 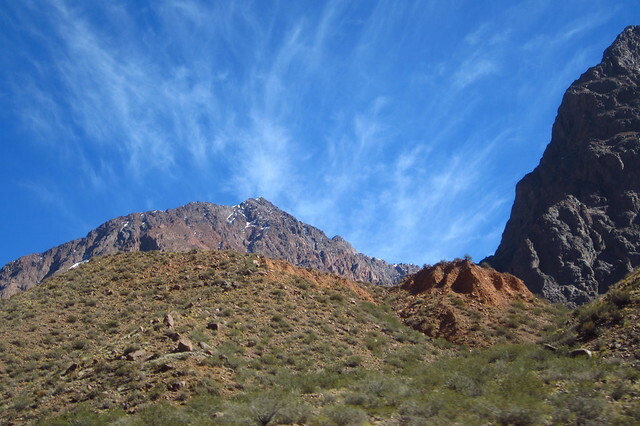 Once again, I saw those familiar Andean foothills, covered in green brush and vegetation. We’d lost an hour crossing the border (and time zones), and the sun disappeared from sight while we continued our journey towards the capital city. With the winter clouds in the sky, it made for a truly impressive sunset. 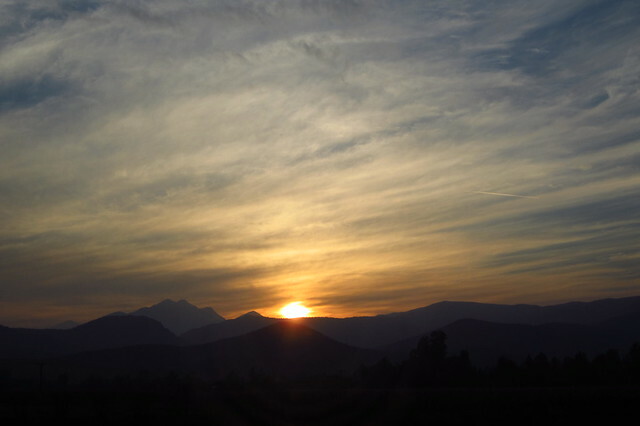 This is still one of my favorite sunset pictures, captured from the window of a moving bus! As we approached Santiago, we entered its suburbs and hit the afterwork traffic you should certainly expect on a Friday evening. 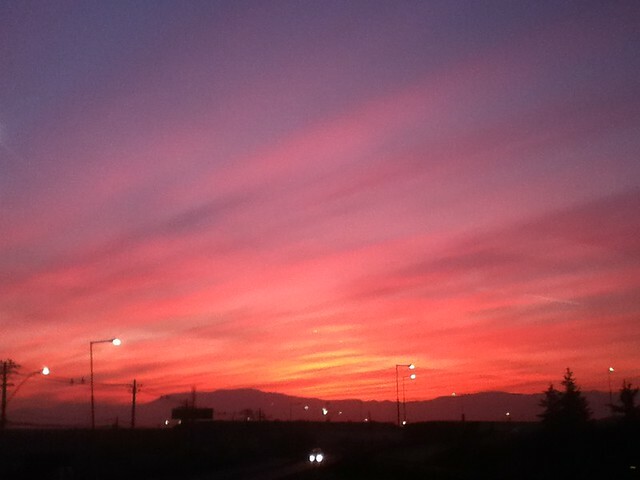 I had already put my D40 away, but looked out the window to see this crazy pink sunset. If you can believe it, I took the above photo with an iPod touch! I couldn’t let these pink colors disappear into memory. 🙂 This ended up being the last clear sky I saw for a few days, so it was well worth documenting. Finally, we arrived to the bus station in Santiago, which is located in the midst of a major transportation hub. All the Chileans on my bus were complaining about the location of the bus terminal in the center of the city. We spent an extra hour inching along city blocks during the rush hour commute. By the time the bus got there, I was antsy to get off the bus and stretch my legs. I quickly changed some dollars into Chilean pesos and eventually found a taxi to take me to my friend Francisca’s house in Providencia. Since I’d had no way to call Fran to let her know I was running late, she had generously left the key to her apartment with her doorman and a note for me to make myself at home in her adorable one bedroom apartment until she returned from a yoga class. I took the opportunity to make some tea, stretch, and recover from yet another bus journey. When she arrived, we poured ourselves some Chilean wine, fixed some snacks, and excitedly caught up on a couple years of life until 1AM, when I was too tired to keep talking. This was my first exposure to the famed Chilean hospitality, and I knew I was in for a great week in Santiago. Buy your ticket in advance if you’re planning on traveling over the weekend, as I did, to guarantee a seat by the window. Sit on the right side of the bus if you want to watch the river go by. Leave as early as possible. I left at 10AM and I probably should have left earlier to avoid rush hour traffic in Santiago. The border can get really busy with all the buses and cars passing through. Spend all of your Argentine pesos before leaving! Argentine pesos have very little value outside of the country and you will get more for your money if you spend them on souvenirs and snacks before leaving. It’s a good idea to bring some snacks with you for the ~eight hour journey, but keep in mind that Chile has strict rules about what kind of food can cross its borders. Be prepared to eat any fruit, cheese, meats, etc. before you cross the border. They x-ray all luggage looking for food. If you still have Argentine pesos, change them at the currency exchange station at the immigration post. Exchange rates are always best at the border. You can wait until you get to the bus terminal in Santiago, but you won’t get the best rates there. 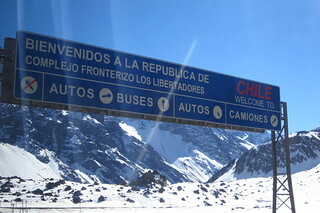 The border is also a good place to change dollars into Chilean pesos.